Both the Cayuga and Yates legislatures named new chairmen for 2018. Meanwhile, Ontario and Wayne counties went with chairmen who had previously held the role in 2017. 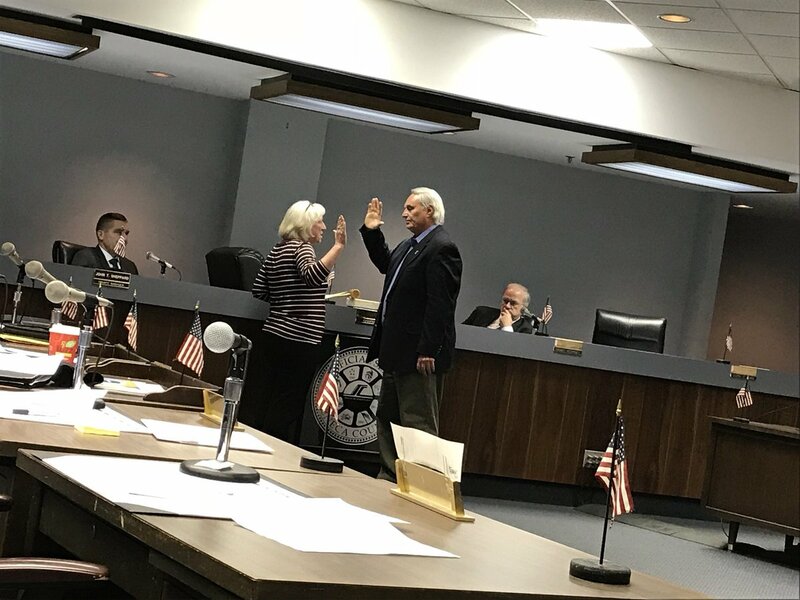 At Thursday’s reorganizational meeting, Waterloo Supervisor Bob Shipley was unanimously appointed to the leadership chair he assumed in 2017, succeeding former Waterloo Town Supervisor Gary Westfall. While Westfall assumed that role in a surprise vote- and outcome – Thursday’s session had neither, despite featuring three new faces. Shipley gave a statement following the appointment, thanking the supervisors for their confidence in his leadership in the new year. Like last year, he said the supervisors need to focus on developing the local workforce, and pushing for greater economic development through the One Seneca vision. Shipley said success on the workforce development side doesn’t stop with county employees. “Seneca County has the fourth-lowest unemployment rate out of New York’s 62 counties,” he added, pointing to del Lago Resort & Casino’s role in lowering that figure in 2017. Continuing to bridge the gap between the northern and southern ends of the county is important, according to Chairman Shipley. “[Seneca County] should not be a community that is divided based on geographic boundaries. We must raise the awareness for everything that our communities have to offer, especially those located in the southern end of Seneca County,” he continued. Shipley said that he remains confident that the board will continue to grow and work together in 2018. – Michael Mirras was named Public Defender for Seneca County. The only other position that was appointed with any type of debate was the ‘Finance Director’ role, previously held by Westfall. He didn’t seek re-election, and was succeeded as Waterloo Town Supervisor by Don Trout. Lodi Town Supervisor Lee Davidson nominated Covert Town Supervisor Michael Reynolds to fill the role, which was seconded by Supervisor Trout. But, before Seneca Falls Supervisor Paul Kronenwetter could move to close nominations – Fayette Town Supervisor Cindy Lorenzetti had one of her own. “I’d move to nominate newly-elected Waterloo Supervisor Kathy Hochadel to the ‘Finance Director’ position,” she said. “She’s a CPA and with her experience in Waterloo I think she’d make a great fit,” Supervisor Lorenzetti continued. Supervisor Hochadel would second the motion made by Lorenzetti, but after just one opposing vote vocalized during the verbal call for support to name Reynolds the finance director – the matter was effectively ended. The Republican and Democratic parties named Supervisor Davidson and Supervisor Lorenzetti as ‘Majority’ and ‘Minority’ leaders respectively. Republicans hold an even larger majority in the chamber in 2018 than they did in 2017 – after Democrats lost two more seats in November’s elections. Editor’s Note: Varick Town Supervisor Bob Hayssen and Ovid Town Supervisor Walt Prouty were absent from the special session on Thursday.